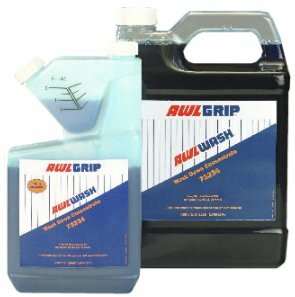 AWLGRIP AWLWASH WASH DOWN CONCENTRATE - To help maintain the mirror-like luster of Awlgrip or Alwcraft 2000 topcoats, Awlgrip has introduced Awlwash Washdown Concentrate(73234). With regular cleaning, Awlwash will help avoid the build-up of dirt and grease which can cause the finish to appear dull. Formulated to clean Awlgrip topcoats, Awlwash does not contain alkalies, acids or abrasives, unlike other "marine soap" products that are not suitable for use on painted surfaces. Awlwash is 100% biodegradable. Awlwash is recommended prior to use of Awlgrip's Awlcare Protective Polymer Sealer and is available in an easy to dispense tip 'n measure quart bottle which can be refilled with the larger gallon-size container. Product is sold by the quart or gallon.